Disclosure: My Life with ABC did not receive compensation for this post and is not responsible for prize fulfillment. 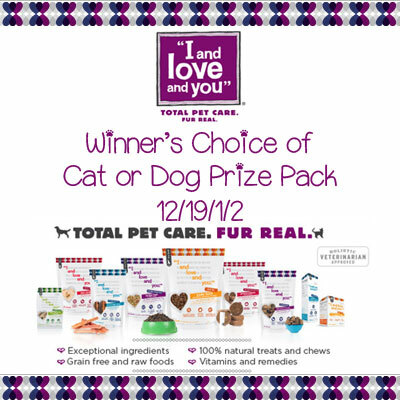 Prize: Winner’s Choice of Cat or Dog I and Love and You Prize PackEvery one of I and Love and You products has been formulated by their holistic veterinarian to include the optimal combination of complete, whole-food nutrition, freshness, and premium ingredients your pets will wag over. They create only the highest quality products because they LOVE keeping your pets healthy. Every one of I and Love and You products has been formulated by their holistic veterinarian to include the optimal combination of complete, whole-food nutrition, freshness, and premium ingredients your pets will wag over. They create only the highest quality products because they LOVE keeping your pets healthy. Enter to win using the widget below. Good luck from ABC and Happy Holidays! !